It may not seem obvious at first that a psychiatric disorder would cause dental problems. However, some of the first telltale signs of bulimia nervosa are often spotted by dentists. Bulimia nervosa can cause serious medical problems as well as dental problems. It’s important for patients with bulimia nervosa to not neglect their oral health, but what exactly are the concerns? Studies show that between 47 and 93 percent of bulimia nervosa patients who vomit exhibit damage to tooth enamel. If you engage in self-induced vomiting, you should be aware that bringing acidic contents of your stomach into your mouth may cause erosion of the enamel surface of your teeth. This damage usually appears primarily on the inside and biting surfaces of the teeth, and the extent of the damage to the enamel can vary between patients. Some factors believed to influence one’s susceptibility to tooth erosion include dietary and oral hygiene habits as well as how often the self-induced vomiting occurs. Not surprisingly, individuals who induce vomiting up to several times a day have a higher risk of developing dental erosion than those who vomit less frequently. However, there can be great individual variation and some people may have more damage with less frequent vomiting. Tooth erosion may become apparent after only six months of self-induced vomiting. Over time as the enamel is eroded by repeated exposure to gastric acid, teeth may lose their shine, break, turn yellow, wear down, chip, and look ragged. Damaged teeth can further exacerbate any concerns about one's appearance. But tooth decay is much more than a cosmetic concern. Your teeth may feel more sensitive to heat and cold. This can make eating more difficult and complicate recovery. In extreme cases, the teeth may die and extensive and expensive dental work to repair the damage may be needed. Regardless of whether or not they engage in self-induced vomiting, many individuals with bulimia nervosa who binge consume high sugar foods, which can increase the risk for cavities. Those who vomit have an even higher risk for dental cavities due to the additional stomach acid. Dentists have recognized a higher incidence of cavities in individuals with bulimia nervosa. Individuals who engage in chewing and spitting, which can be a symptom of other eating disorders as well as bulimia nervosa, can also experience dental problems such as tooth decay and cavities. Frequent vomiting can cause gum irritation and bleeding and sores on the angles of the lips. It can also cause enlargement of the salivary glands along the lower jawbone and in front of the ear, which can cause a “chipmunk cheek” look. Purging may cause a reduction in saliva that can, in turn, lead to dry and/or cracked lips, dry mouth, and a burning sensation in the mouth, particularly on the tongue. Treatment involves stopping vomiting and paying careful attention to oral hygiene. Recovery is the best way to limit tooth damage and prevent medical consequences. If you are suffering from untreated bulimia nervosa, seek help from a treatment professional. You can even start by seeing your primary care physician (who may then refer you to a doctor who specializes in eating disorders). Speaking openly about your condition is important for eventual treatment and recovery. Cognitive behavioral therapy can be an effective treatment for bulimia nervosa. Self-help versions of cognitive behavioral therapy may also be helpful for some. Once the vomiting has stopped, patients with bulimia nervosa sometimes opt to have more extensive dental repairs. Recovery from an eating disorder takes time. In the meantime, if you are still vomiting, there are some things you can do to minimize damage. Previously, patients were advised not to brush with fluoride toothpaste after vomiting episodes because there was a concern it would cause more damage. However, this has never been proven. The current recommendation is to brush gently with fluoride toothpaste and then rinse with a neutral PH mouthwash or a baking soda solution (one teaspoon in one quart of water) to neutralize the acid residue. Salivary gland swelling may be helped by hot compresses and tart candies. Although you may feel embarrassed, you should also see a dentist regularly for check-ups. Try to be honest with them about your bulimia nervosa so they can help prevent more significant dental issues. 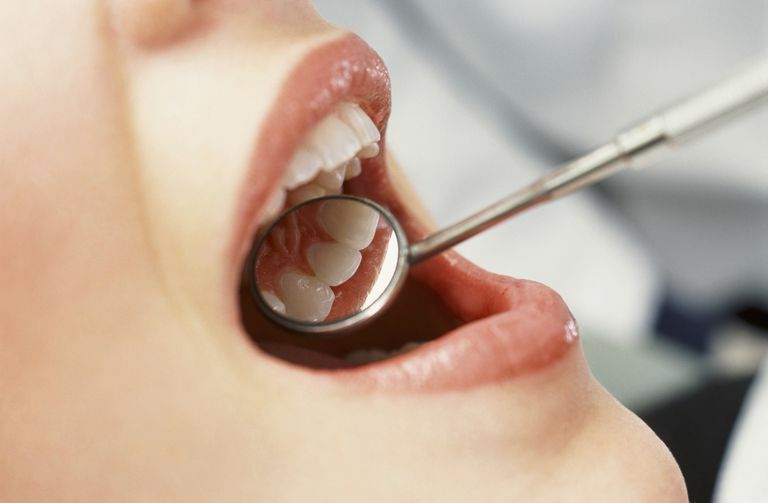 Untreated dental problems could also lead to more serious medical complications. What Is Driving Your Binge Eating?